Learning how to do something is easy if you know where to look—and if you have a Mac nearby with an Internet connection. On the iPhone, however, tutorials are harder to come by. I Will Survive: Among the features in WikiHow, an app that taps into the how-to Web site of the same name, is a survival kit that gives you tips on how to withstand life’s little setbacks. WikiHow puts the power of a vast how-to Web site right on your mobile device, with mostly textual explanations for even complex tasks, such as how to create a chair or make a saltwater lure. The free app for the iPhone and iPod touch taps into the power of the WikiHow.com site and shows step-by-step instructions with photos and the occasional video. For the most part, WikiHow is an indispensable tool. I found tutorials on how to play drums, tune a guitar, and make a vegan desert without any trouble. In a few cases, the videos won’t play on the iPhone—such as those uploaded using the VideoJug service. The app has icons for a survival kit (in case you break a leg, for example), featured how-tos, your own bookmarks, search, and settings. The latter button lets you configure fonts and delete the cache. You can even shake your mobile device to summon a random how-to, which is just a fun diversion. That said, the how-to encyclopedia is not completely exhaustive. A few how-tos are not available—I tried to find one on testing audio latency in a home recording studio, for example. WikiHow did not find one, but a simple Google search revealed the answer quickly. 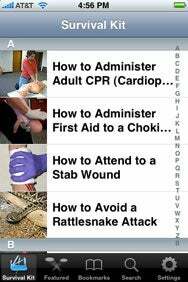 In that sense, WikiHow is not that different from just using your iPhone browser. And, the instructions are not 100-percent reliable. In one case, instructions for how to increase the speed of a wireless router forgot to mention that you should turn off devices that cause congestion—such as a microwave. The app also does not allow you to create your own how-tos from the iPhone. WikiHow does provide of wealth of info, though, making it easy to recommend. It’s fast, the video and photos are helpful, and if you do happen to search for a how-to that is not available, you can go online when you get back to your Mac and write one up and be a help to others. WikiHow is compatible with any iPhone or iPod touch running the iPhone 2.2.1 software update.